Early "servos" were nothing more than the electromechanical equivalents of rubber band-powered escapement. Rather than energizing a solenoid that would allow the rubber band to turn the control arm, the pulse signal from the receiver would set a motor in motion, and then limit switches would stop it once the predetermined position was reached. They had a number of advantages over rubber-powered escapements in that the power delivered to the control surface was not diminished with every actuation (except from some negligible energy drain from the batteries), they were able to deliver a lot more power, and they took up less real estate inside the fuselage. It was a first step toward today's proportional servos. 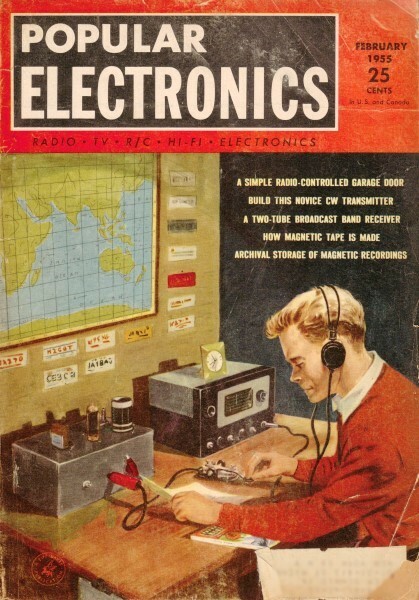 The more advanced the radio-control hobbyist becomes, the more functions seeks to control on his model airplane, boat, or racing car. To effect multiple control operations, complicated escapements have been designed. Some of these will be explained in this article. The escapement illustrated in Fig. 1 was created in order to obtain direct control over two physical functions using a single-channel type receiver. In model aircraft for example, it is used to control both rudder and elevator. One particular advantage of this unit is that it only deflects the control surfaces in the "on" signal positions and returns both to neutral in the "off" signal positions. This is a safety feature of considerable merit. Fig. 1. A type 2 compound escapement in which one standard two-finger escapement is used to actuate two separate control loops via a cam. Notice that this escapement consists of two two-finger escapement arms and catch- points located on a single plate with a cam mounted between them. The cam has a pin extension C. In the drawing, a spring is shown holding catch-points 2 and 3 firmly against the cam wheel causing 1 and 4 to rise up and intercept fingers A and D. This is the starting neutral position. If now, a signal is sent causing the standard two-finger escapement to move finger F to position 6, the cam is caused to rotate 90 degrees counterclockwise pushing catch-point 2 forward causing catch-point 1 to move down, releasing A. As A rotates clockwise, finger B is intercepted by catch-point 2 and held. Loop N is deflected to the left. Now assume that the signal ceases. The arm on the standard escapement rotates another 90 degrees until G is intercepted by 5. Through loop L, the cam is rotated another 90 degrees, allowing catch-point 2 be pulled back by the spring and forcing 1 up to intercept B. Loop N is again at neutral. Another "on" signal causes the cam to push catch-point 3 forward to intercept E, deflecting loop M to the right. An "off" signal sends the cam back to the starting point, leaving E held firmly by 4 and loop M again at neutral. Tracing the action through a second evolution of the cam will show that first loop N is deflected to the right, then brought to neutral, then loop M is deflected to the left, and brought back to neutral. It has taken two complete revolutions of the cam to go through the complete cycle of operation for both loops. Although it is necessary to go through the complete cycle in order to effect any one desired control and return to the original starting position, this is not necessarily a disadvantage if the operation is done fast enough. Other surfaces may move, but will not be held in a deflected position long enough to affect the steering. Another multiple escapement, this one sold by ECCO, is illustrated in Fig. 2. 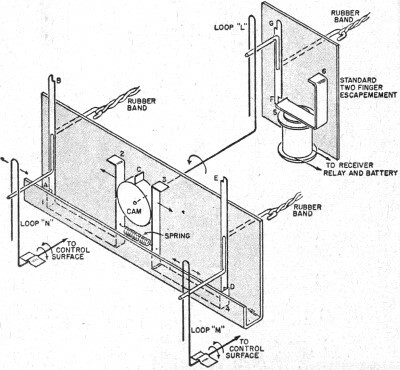 The back cover has been removed in order to reveal the special working parts. It, too, allows control over two physical functions. It is a single, self-contained unit requiring but a single rubber band for power. The movement of the two output shafts is obtained through the use of the two specially shaped cams, the two "Y" yokes, and two sets of "four-fingers" which engage the armature catch-points. The two catch-points are offset from each other so that only one set of fingers contacts the "on" catch-point, the second set contacting the "off." This is illustrated in Fig. 3. If the outer cam of Fig. 2 were to rotate 90 degrees clockwise because of rotation of the fingers, the protrusion of the cam would force the left half of the "Y" yoke to the left. At the same time the indented portion of the cam is moved opposite the right half of the yoke, allowing motion to the left. Another quarter revolution returns the "Y" to neutral. The third quarter revolution moves the "Y" right, and the final 90 degrees returns the "Y" to neutral and the cam to its original starting position. This action has taken place in four steps. Since there are two sets of "four-fingers," mounted as illustrated in Fig. 3, there are actually eight catch positions instead of just four. 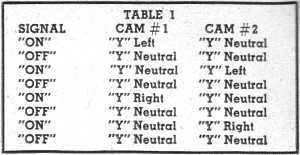 Thus, with the proper placement of the two cams, the signal sequence is as shown in Table 1 . Notice that the deflection of the yokes occur only in the "on" signal positions. This again is a fail-safe feature. Fig. 2. (left) Back view of an ECCO compound escapement which uses two four-finger units and two cam wheels to actuate two "Y" yokes, each with its own shaft. This allows two control functions. Fig. 3. (right) Simplified drawing of the ECCO compound escapement showing how the four-finger units operate separately with a single solenoid. First, to remove any mystery that might be connected with the word servo, this word comes from the Latin and means slave. Since slaves were once used to do the hard physical work, the word in modern electronic parlance has come to mean the unit which furnishes physical power in a control system; in particular, motors. The De Bolt 2PN "Multi-Servo" shown in Fig. 4 is an electric motor with associated reduction gears, switches, and anti-coast device. It can be used in the same manner that the standard two-finger escapement is used to move control surfaces. The designation 2PN indicates its operation. This stands for "two positions-one neutral." Fig. 4. Top and side views of a typical servo unit for radio control. Motor is about 1" wide. Examination of Fig. 4 will reveal the small brass terminal on the face of the fiber disc to which the linkage to the control surface is fastened. Notice also the two brass switches mounted below and behind the output disc, and the small fiber pins on the inside of the fiber disc which open the switches at the proper time. 1. No rubber bands are required. 2. Servos are small and lightweight (2 ounces). 3. They have fast response and are reliable. 4. They require conservative battery power (2 pen cells or their equivalent). 5. They are failure-safe in case if receiver failure. 6 They consume no power in any control or neutral position. 7. They are rugged and compact. 8. They have a simple and definite control sequence. The sequence is easy to remember and transmit using a standard pushbutton, it is "off" for neutral; "on" for left; and "on-off-on" for right. Fig. 5 shows a typical wiring setup for a servo. 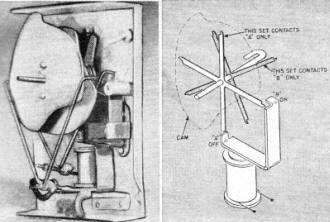 Notice the fiber disc and the fiber shafts labeled N, R, and L. In the position shown, neutral, shaft N is depressing switch 2, opening its connection to D. The shaft does not open switch 1 since this switch is located lower than switch 2 and shaft N is placed nearer the center of the disc than L or R.
Fig. 5. Physical drawing indicating how a servo may be used in a radio-control model airplane for proportional control of the elevator. It can be used also for the rudder. Let's trace through a signal sequence to see the operation. First an "on" signal is transmitted. The armature of the receiver relay F is pulled down to make contact with G. This lets power flow from the battery through the relay to B of switch 1. B is making contact with A, so the power goes through this switch to one side of the motor. 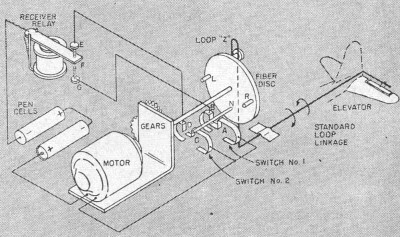 The second motor lead is permanently fastened to the battery, so the motor runs, turning the fiber disc in a clockwise direction until shaft R opens switch 1, breaking the circuit and causing the motor to stop. As the fiber disc rotates, it moves loop Z to the right, giving down elevator. As long as the signal is sent, the loop will remain deflected, but since the circuit to the motor is open, the servo consumes no power. Now the signal ceases. The receiver relay armature moves from G to E. Power now flows through switch 2 to the motor, causing it to run again. It runs until shaft N opens switch 2, opening the circuit. Loop Z is back to neutral. To get up elevator, the sequence is "on-off-on," holding the second "on" as long as this control position is desired. It is important that the sequence be sent at a medium rate and not too fast. The first "on" causes the motor to run as before, but in­stead of stopping, the "off" signal comes and routes power through switch 2 while switch 1 is being opened up by the shaft R. The second "on" comes as L approaches switch 1, and since this signal is held, the motor stops running when L opens switch 1. The loop Z will now be right, giving up elevator. When the signal stops, the motor again returns the loop to neutral. While the illustrated action has concerned the elevator, it should be mentioned that it works as well for rudders or steering wheels.